No One To Hear You Scream by Julia Madeleine. Non-series. Black Heart Books Trade Paperback, March 2011. Most of this book involves the intersection of the lives of the four strongly drawn characters, but this is at best an uneven thriller, with several plot points introduced with the potential of generating suspense in an otherwise predictable storyline but little developed from them. 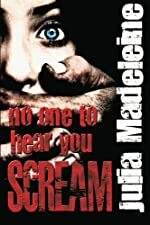 Read the full text of our review at Mysterious Reviews: No One To Hear You Scream by Julia Madeleine. Read the first chapter(s) of No One To Hear You Scream below. Use the Aa settings button to adjust text size, line spacing, and word density.